A trip to San Diego last month gave me the opportunity to check out the squirrel situation there. The native vegetation is coastal sage scrub and chapparal, with oaks and pines in higher and wetter areas, and desert to the south and west—very different from the deciduous woodlands of eastern North America which so many squirrels call home. The vegetation of San Diego has been greatly modified by man, however, with introduced species now dominating the cityscape– Eucalyptus (from Australia) and exotic palms (from everywhere) are omnipresent. 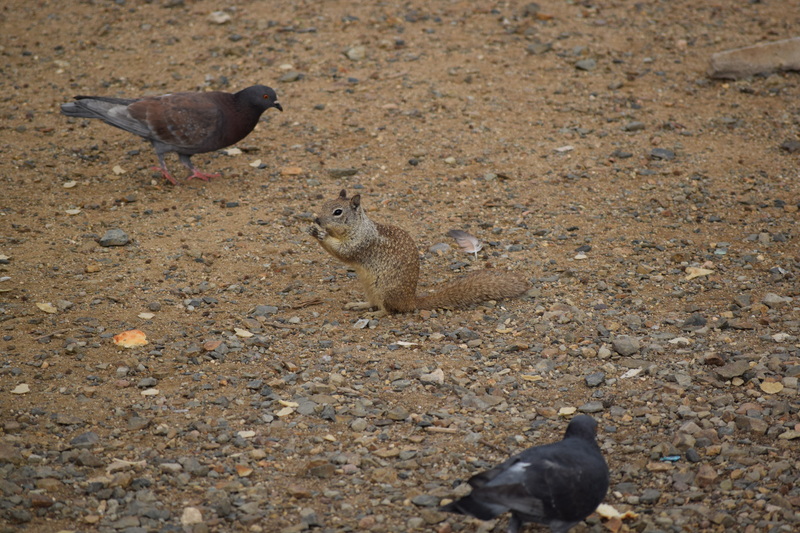 On the second day of our visit, we hit squirrel pay dirt in Balboa Park, a large urban park with little or nothing of its natural vegetation remaining. Appropriately enough, the squirrel was an introduced species, the fox squirrel, Sciurus niger. They were first recorded in San Diego in 1929. Fox squirrels (Sciurus niger), Balboa Park, San Diego, California, 16 January 2019. A third fox squirrel, also outside the visitors center, sat in a classic squirrel pose. Fox squirrel (Sciurus niger), Balboa Park, San Diego, California, 16 January 2019. On another visit to Balboa Park a couple of days later, I was able to get up close and personal with this guy, and needed to use flash, hence the red-eye. Fox squirrel (Sciurus niger), Balboa Park, San Diego, California, 18 January 2019. The eastern gray squirrel (Sciurus carolinensis) was also introduced to Balboa Park, in 1924, but has apparently disappeared. 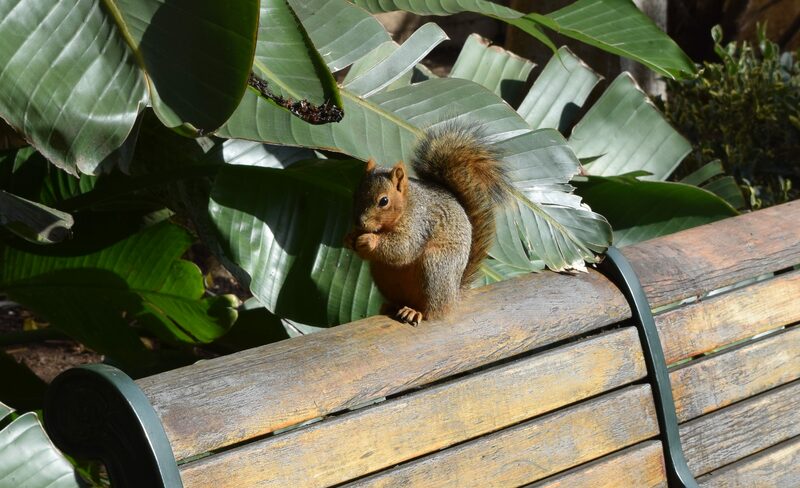 During an 8-day stay I saw fox squirrels only in Balboa Park, not in other parts of the city. The native western gray squirrel, Sciurus griseus, is found only in the mountains in San Diego County. Cities in the eastern half of the United States often have tree squirrels as a prominent element of their urban fauna. In much of the northeastern quadrant of the country, the “city squirrel” is the eastern gray squirrel, Sciurus carolinensis. From personal observation, this species is the city squirrel of Boston, New York, Washington, DC, Chicago, Milwaukee, and Madison, WI. 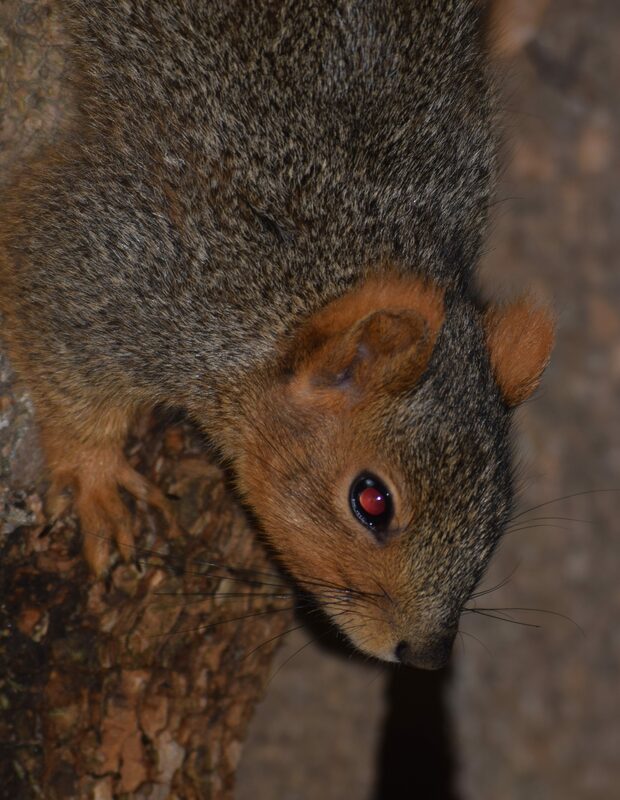 As you head to the south and west, however, another species of tree squirrel, the somewhat larger fox squirrel, Sciurus niger, becomes a possibility. It is the city squirrel of Springfield, IL, and, quite exceptional for being so far to the north and east, Ann Arbor, MI. (On one of my first visits to that city, I remarked to someone that the city had the biggest gray squirrels I’d ever seen, and they replied, yeah, that’s because they were fox squirrels!) Both of these eastern species have been widely introduced elsewhere, the gray squirrel even overseas, including Great Britain and Ireland. 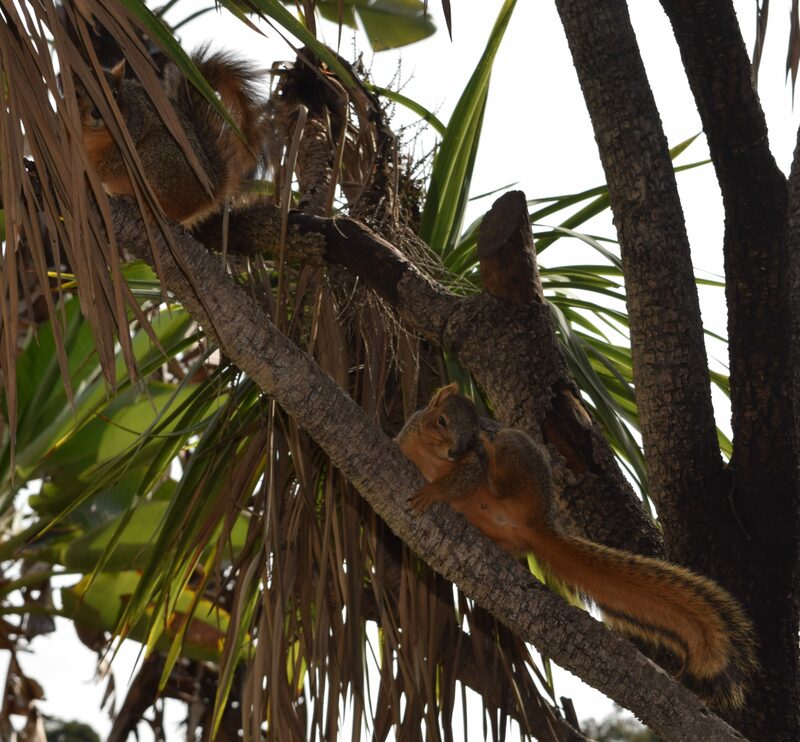 To see native squirrels, we had to go to San Ysidro, the southernmost part of the city of San Diego, on the Mexican border. 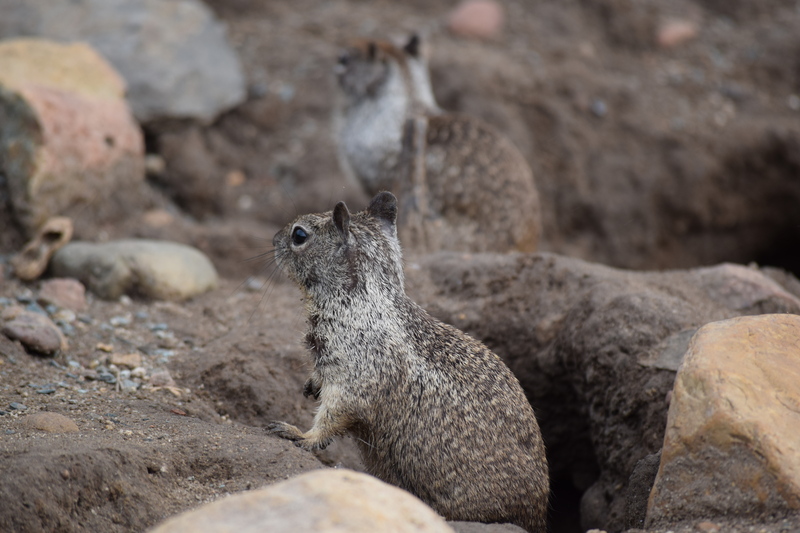 As we walked to the border crossing there, we saw, on the slope to the east of the pedestrian approach, a modest colony of California ground squirrels, Spermophilus beecheyi. The white patch on the shoulder, extending somewhat in a line on the flank, is diagnostic; and in the out-of-focus individual in the background you can, paradoxically, see more clearly the dark area from the head onto the nape that separates the two shoulder patches. Note that someone seems to have thrown them a peanut (chewed on shell at left). California ground squirrels (Spermophilus beecheyi), San Ysidro, California, 17 January 2019. Ground squirrel tails tend to be less bushy than tree squirrel tails, but this species’ tail is fairly bushy. From the angle in the picture below, the squirrel even looks a fair amount like an eastern tree squirrel, since you can’t see its shoulder and nape. California ground squirrel (Spermophilus beecheyi), San Ysidro, California, 17 January 2019. In the next picture, we see a broader view of the colony, with scant, scrubby vegetation, including cactus; there were some scelrophyllous shrubs, as well. Bonus question: How many squirrels can you spot? 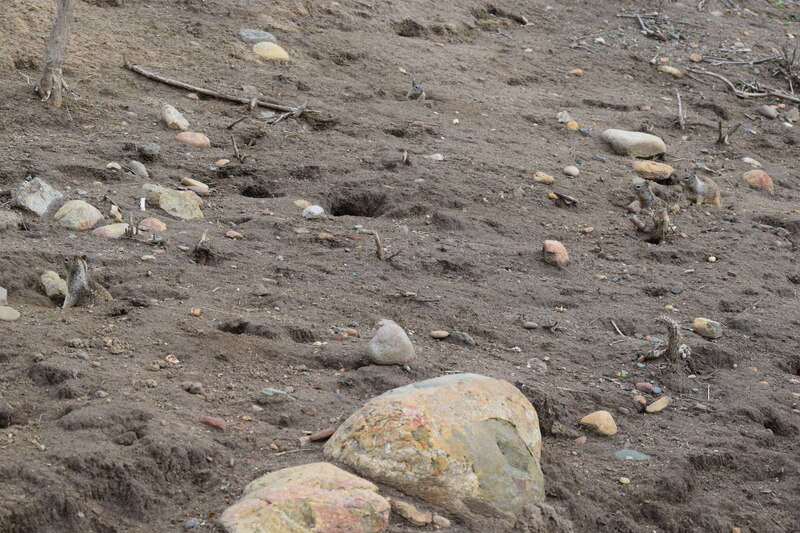 The ground squirrels also occurred just over the border in Tijuana. California ground squirrel (Spermophilus beecheyi), Tijuana, B.C.N., Mexico, 17 January 2019, with Rock Doves (Columba livia). There are many species of ground squirrels in western North America, but none in the east. (The easternmost is the thirteen-lined ground squirrel, which reaches the Midwest.) Many of these ground squirrels have more geographically or habitat restricted distributions. The white-tailed antelope squirrel, Ammospermophilus leucurus, is a desert species, which in San Diego County is found only in the eastern part of the county. The one below is in an exhibit hall, Coast to Cactus, at the San Diego Natural History Museum, devoted to the various biotic communities of southern California. It is a model, not an actual specimen. 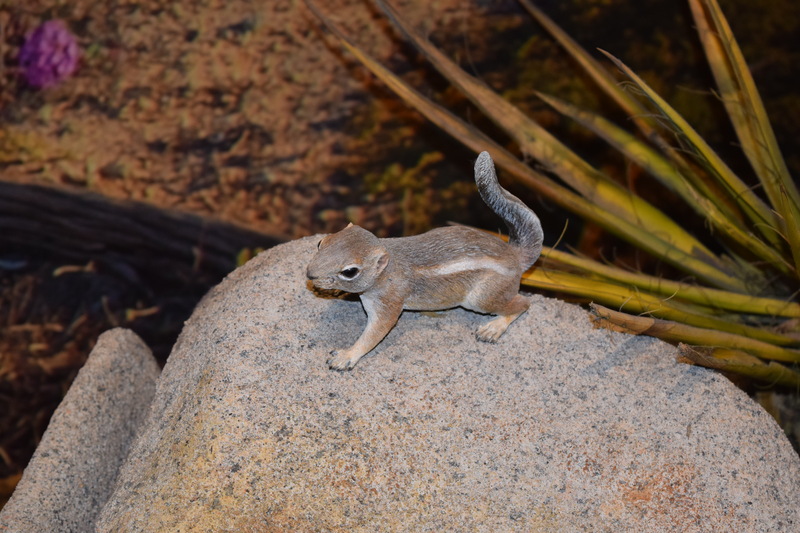 White-tailed antelope squirrel (Ammospermophilus leucurus), model, at San Diego Natural History Museum. And, to enlarge this account to include all of my encounters with incisor-enhanced critters in San Diego, here’s a Desert cottontail, (Sylvilagus audubonii), also in Balboa Park. 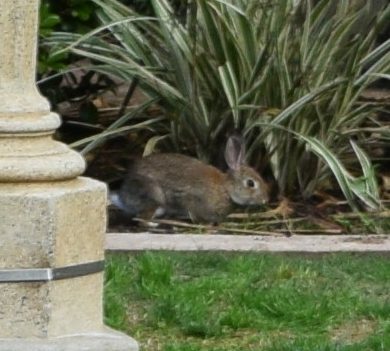 Despite the common name, this is a common rabbit in a broad range of habitats, including urban-suburban ones, in San Diego. Desert cottontail (Sylvilagus audubonii), Balboa Park, San Diego, California, 16 January 2019. The San Diego Natural History Museum has been a leader in providing online access to its publications, collections, and exhibits, and for mammals there are a number of resources, and I’d point in particular to the various guides listed here, their checklist of the mammals of San Diego, and Suzanne Bond’s annotated list. They have recently published a truly excellent atlas of the mammal of San Diego, which I was able to consult while in San Diego, but not while writing this post, so if you’re interested in the exact details of the introductions and distributions of the species mentioned, you should consult the Atlas. 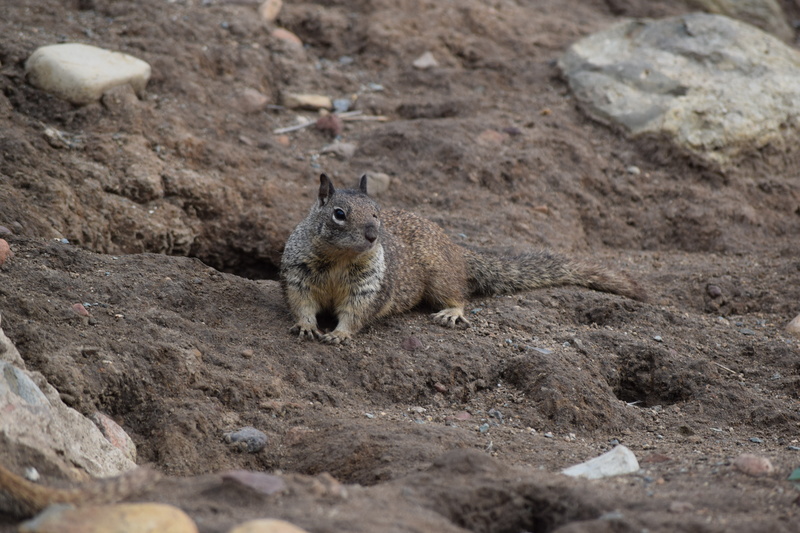 This entry was written by whyevolutionistrue and posted on February 3, 2019 at 12:00 pm and filed under squirrels with tags Baja California, California, California ground squirrel, Desert cottontail, Fox squirrel, San Diego, San Ysidro, squirrels, Tijuana. Bookmark the permalink. Follow any comments here with the RSS feed for this post. Both comments and trackbacks are currently closed. The eastern gray squirrel disappeared!? Everywhere else, they seem to take over. Perhaps they were eradicated? Is that the one that upped-sticks and moved to Europe around a century ago. I think they just failed for some ecological reason. Likewise, western gray squirrels seem unable to persist or form populations in most of lowland southern CA, despite all the planted trees and varied fruits available. They seem to be essentially strays when they appear, though they can turn up 20 miles from the mountain front. Fox squirrels are still spreading across urban S CA and are increasingly common, so they clearly differ in some way that makes them better adapted to local conditions. Better heat tolerance? Disease resistance? I was surprised to learn the Fox squirrel was an invaisive species anywhere; it seems more persnickety than its little grey cousin. Greys are so cosmopolitan, so comfortable in cities, around humans, and willing to eat damn near anything that it is equally surprising to hear they failed to invade San Diego. Greys will quite quickly ransack and clean out a bird feeder full of sunflower seeds, yet the Fox Squirrels in my yard took a year and a half before venturing onto the feeder, and it didn’t stay long. We have a winner! I had counted 3, but double-checked, and there are 4. You now have squirrel bragging rights! Old groves of Bur Oak Trees are perfect for the Fox squirrel. They build nests in these trees and bury thousands of nuts that drop from them in the fall. Other than that, they mostly multiply. They make great outdoor pets, just don’t bring them inside. Yes, they like bur oaks– fox squirrels are oak savanna squirrels. In eastern Kenosha Co., Wisconsin, where it’s mostly maple-basswood forest, fox squirrels are very rare, grays very common. I’ve met people from 2 counties over to the SW in northern Illinois who hadn’t seen gray squirrels till they came to Kenosha– it’s all fox squirrels by them. 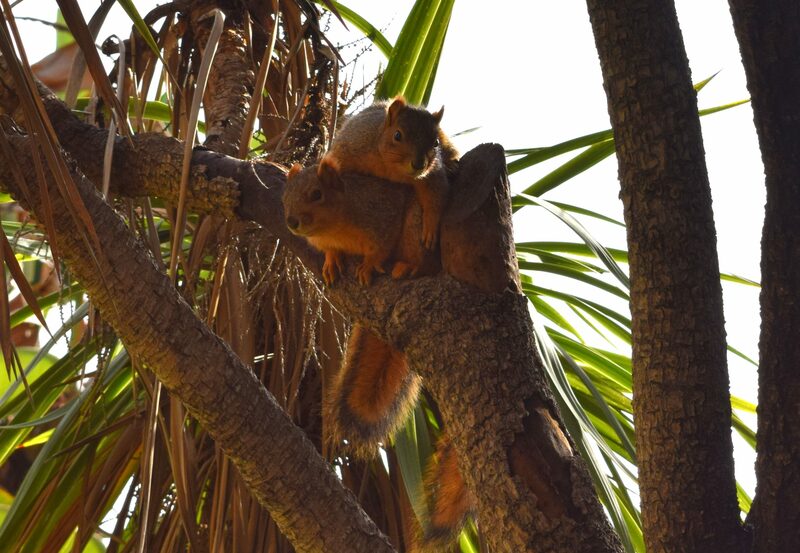 I don’t know why, but it’s strange to me seeing squirrels in a palm tree. Would it feel less strange if I told you it wasn’t a palm at all but tree-like asparagus relative? 🙂 Cordaline australis, from New Zealand. Cool, thanks, even stranger. Squirrels!!! I thought it was a Dracaena! thanks… Oh – but I see they are related! I enjoyed your post, Greg! Thanks. Greg Meyer – Special Squirrel Correspondent! We have squirrels among the sage brush and Russian olives in southern Idaho. They are red squirrels which I see most days around the house. Perhaps eight species of ground squirrels live here, but I have yet to encounter one. Why have the western grey squirrels disappeared from Pine Valley, CA?